Often referred to as the Oxford of the East, Pune is a bustling hub of multifarious people and activities and is in the contention for rapidly growing into one of the top metropolitan cities in the country. When someone says Pune, you immediately think of a laidback, yet lively town with a young and vivacious crowd that welcomes every visitor with an open heart. However, there is a lot more to Pune than just its youthful vigour. Behind the modern commercialized façade of Pune lies the roots of ancient Poona, which gave birth to the Maratha Empire and had a very crucial role to play in the history of India’s independence. Pune is a city that perfectly blends modernity with tradition, and it deserves the title of being the cultural capital of Maharashtra. Pune is dotted with palaces and temples that are reminiscent of the city’s ancient heritage, the most important of these being the Shaniwar Wada palace and the Aga Khan palace. The Shaniwar Wada palace is a sprawling monument that used to serve as the seat of power for the Peshwa rulers back during the Maratha Empire. Constructed by Peshwa Baji Rao I after his victory in the Third Anglo Maratha War, this palace is no less than an architectural marvel. Comprising of nine bastions, five gateways, intricate latticework and a beautiful mountain, the Shaniwar Wada Palace allows you a glimpse into the history and architecture of the Peshwas. The Aga Khan Palace is another palace that is steeped in history. Built by Sultan Muhammed Shah Aga Khan III this palace has been witness to countless important events in the Indian war of independence, including the imprisonment of Mahatma Gandhi and other important freedom fighters. Boasting of beautiful Italian arches, lush green lawns and large hallways which are now used to display exhibits from the lives of various freedom fighters, the Aga Khan Palace is an important tourist attraction, especially for history buffs. The Singhagad Fort is a must-visit spot in Pune, and due to its alluring location on the Bhuleshwar Range of the Sahyadri Mountains, it offers excellent trekking trails to the top of the cliffs. The fort once acted as a very important military outpost during the Maratha reign, but a large part of it lies in ruins today – a fading remnant of the glorious past. For those wishing to experience the grandiose Maratha architecture coupled with stunning views of the Sahyadris, the Singhagad fort is a must-visit tourist attraction. Pune is also home to many temples, the important ones you can visit is the Dagaduseth Halwai Ganpati Temple, the Pataleshwar Cave Temple, and the Chaturshringi Temple. While Pune has plenty of options for eating, ranging from street food to high-class restaurants where you can enjoy all kinds of cuisines, Pune is renowned for its bakery items. Ranging from a variety of cookies, pastries to even cakes, don’t forget to try out Pune’s mouth-watering bakery items. The mighty edifice of Aga Khan Palace is situated in Pune and was built by Sultan Muhammed Shah Aga Khan III in the year 1892. It is one of the most important landmarks in Indian history and has been instrumental in many defining moments of India's independence. Aga Khan Palace is well known both for its architectural excellence as well as its historical significance. Spread over a vast land of 19 acres, the palace is now the headquarters of the Gandhi National Memorial society. Here, making khadi is still one of the prime activities. The Palace is a grand building and it is very crucially associated with the Indian Freedom Movement. The reason behind the construction of this palace was to support the poor in the neighbouring areas who were hit by famine. In the memory of Kasturba Gandhi and Mahadev Desai, architect Charles Corea had their memorials built in the premises of the palace. The palace houses a museum which holds a rich collection of pictures. There are also other items like the personal belongings of Gandhi. The Palace also has the ashes of Mahatma Gandhi hurried in its ground. In 2003, the monument was declared to be of national importance. The former love-nest of Bajirao and Kashi, the Shaniwar Wada in Pune is now one of the most popular tourist destinations in Maharashtra. This grand mansion was built by the Peshwa Bajirao I himself as the residence of the Peshwas. Covering a vast area of about 625 acres, the palace is the ideal place to catch a glimpse of India's rich history. The place never fails to amaze the visitor with its various forts and fountain, and the majestic statue of Baji Rao I that greets the visitor at the entrance of the palace. However, such was the fate of this magnificent complex that it is now the most haunted places of Pune. The palace which was constructed with great enthusiasm and excitement to witness laudable tales of the Peshwas sadly saw nothing other than deceit, ill fate and torment. In the very first year of its completion, the palace saw an untimely death of Peshwa Bajirao I, his disloyalty to his first wife Kashi, and the unfinished love story of Bajirao-Mastani. Once reputed for its marvellous architecture, the palace is now dreaded for its paranormal activities. This and much more has made the site a must-visit place. So, be sure to include it in your itinerary when you next visit Pune. The Bund Garden is situated in the city of Pune and is deemed as one of the most beautiful and well-maintained gardens in the city. Also known as Mahatma Gandhi Udhyan, it is a favourite among joggers and people who enjoy spending time outdoors in the sun. The locals here prefer the garden as their go-to place when looking for some quiet and calm, and Bund Garden attracts a lot of visitors during the morning and evening hours. Another attraction here is the Fitzgerald Bridge, which garners as many tourists as the Bund Garden itself. The garden is a beautiful place for the elderly and kids and is a famous picnic spot for families and youngsters as well. Bund Garden has a well-maintained layout that is abundant with natural flora and verdant greenery. You will see a walking track laid down all over the place and people enjoying a picnic with their friends and family. Another reason that makes Bund Garden one of the locals' favourite is that it is surrounded by some of the most well-known eateries in the city which serve quality food at nominal prices. Once you are done with your daily routine of exercise, you can head down to any one of these places and treat yourself to a little reward! The place is ideal if you are an early riser and fitness fanatic, and is a must visit if you enjoy quiet time in the lap of nature. A place known for its serenity and surreal ways to meditate away from the hustle and bustle of city lives, Osho Ashram is popularly known as Osho Meditation Resort. Located in Pune, the unique blend of meditation and the Greek concept of resort stay make this experience a truly memorable one. The Ashram is a tranquil place which brings you to your own centers of peace, meditation & oneness. The ideologies of Osho also can be found here. People visit the Osho Ashram to meditate, facilitate and channelize their inner thoughts and feelings and usually to reconnect with their inner being. The Ashram is a wonderful place to hunt for the meaning we tend to look for in our everyday lives. Started in 1974, Osho Ashram witnesses a huge number of visitors throughout the year, especially the foreigners. This exciting and intense place has a distinctive atmosphere. The members here can indulge in various dynamic meditation sessions and therapies throughout the day. Interested folks can choose from the Osho guesthouse or the Osho living in the program, according to their whim. The usual schedule at Osho Ashram includes Dynamic meditation, Vipassana meditation, Nadabrahma meditation, Kundalini meditation; the list is endless. There is a gamut of activities available to soothe your mind and strengthen your inner strength through natural means. Their teachings mainly revolve around control over one's mind, meditation, Sannyas and renunciation. Millions of people have gained immense peace by participating in the activities at Osho Ashram at Pune and hence throwing light on its influential consequences of people from all across the Globe. Although initially, it seems to be functioning as any regularly paid resort, Osho Ashram provides the real soothing relaxation to the visitors. With a mind-boggling number of activities to keep you actively engaged, this place is like an entirely new world that deals with the ideal ways to survive and remain happy in one's life. Dehu Gatha temple is one of the largest temples and is located near Pune. At the entrance of the temple lies the statue of Sant Tukaram Maharaj. What attracts people the most are the carvings of all Gathas of Sant Tukaram on the walls of the temple which are very easy to read. It is said that one must read at least 3 Gathas on visiting the temple. The temple is located on Indrayani River's bank. Also, there is a place on the river where these Gathas floats which should not be missed out. Dehu is a spiritual place wherein Saint Tukaram was born. It is a place of the pilgrims. The temple of Saint Tukaram was built in Dehu in 1723. It is said that the home where he used to reside is still in existence. One of the main attractions of Dehu is palakhi in the month of ashadh. Every year during palakhi, numerous people participate and remember the Gathas of Saint Tukaram. The place is a powerhouse for the followers of Saint Tukaram. A garden has also been dedicated to Tukaram's wife, and rock has been built to commemorate his 13 days fast. The Katraj Snake Park is the most visited and loved tourist attraction in the Rajiv Gandhi Zoo that is located in Katraj, near the city of Pune in India. The Rajiv Gandhi is a famous and grand zoo that is spread over an area of 130 acres and is managed by the Pune Municipal Corporation. It is divided into three parts: the central zoo, an animal orphanage, and the most famous of all: the Katraj Snake Park. The snake park has successfully managed to acquaint thousands of visitors with the unusual and fascinating wildlife through its extensive collection of snakes, reptiles, birds and turtles. The Katraj Snake Park is a time-tested proof that fantastic and fun-filled places necessarily need not be expensive. The snake park is home to over 22 species of snakes with ten species of reptiles, that comprises of more than 150 individuals. This marvellous collection also includes a 13-foot long king cobra. In 1986, Mr Neelam Kumar Khaire, who was the first director of the park, with assistance from the Pune Municipal Corporation, had created the Katraj Snake Park on the land that was to become the Rajiv Gandhi Zoological Park later on. The park since then has garnered thousands of nature enthusiasts and animal lovers. The Snake Park organises a myriad of snake festivals and snake awareness programs to clarify doubts that people may have about snakes and to destroy fears about snakes. During Nag Panchami, the park also arranges programs that aim to focus on discouraging the ill-treatment of snakes. The species of snakes include Cobra, Pythons and Russell's vipers. Think of the Katraj Snake Park, and words like joy, laughter, fun and family moments would immediately pop up in your mind. This is exactly why a visit to this tourist attraction is a must to again get in touch with your lost childhood and adventurous streak. Mulshi is the name of a major dam on the Mula river in India.It is located in the Mulshi taluka administrative division of the Pune district of Maharashtra State. Water from the dam is used for irrigation as well as for producing electricity at the Bhira hydroelectric power plant, operated by Tata Power. The station operates six 25MW Pelton turbines established in 1927 and one 150MW Pumped Storage Unit. Water from this reservoir located in Krishna river basin is diverted to the Bhira power house for generating Hydro electricity. National War Museum was built by Express Citizen’s Forum, an organisation of Pune citizens. After the stone laying foundation held in November 1977, the museum was opened in October 1998. Situated at Pune Cantonment, an area reserved for armed forces, the museum is made of pillars and measures 25 ft in height. Its construction done by collecting funds from the citizens of the country made it the only war memorial in South Asia to be built by raising funds from the public. On display in the museum is a MIG 23 BN that was used in the Kargil War. Panshet Water Park offers many opportunities for watersports like kayaking, swimming and wind surfing. In the park, tourists can also avail water scooters and rides on speed boats. A watersports centre, it is situated amidst the beautiful Sahyadari Mountains. Located in the surroundings lying between two important dams, Varasgaon and Panshet, the park lies nearby Raigad Fort, Sinhagad Fort and Khadakwasla Dam. Sinhagad Fort is located at a distance of 35 km from Pune. Meaning 'The Lion's Fort', it is situated on a hill rising 800 m above the surrounding countryside. Site of the Battle of Sinhagad in 1670, the fort was previously called Kondana. At an elevation of 1,350 m above sea level, the fort lies on an isolated cliff of the Bhuleswar Range of the Sahyadari Mountains. Kalyan Darwaja in the southeast and the Pune Darwaja in the northeast mark the entrances of the fort. Named after the sage Kaundinya, the previous edifice of the fort contained Kaundinyeshwar Temple, caves and carvings. Believed to have been built 2,000 years back, it was captured from the Koli tribal chieftain, Nag Naik, by Muhammad bin Tughlaq in 1328 AD. A memorial to Tanaj, as well as the tomb of Rajaram, who was Shivaji’s younger son, is also located within the complex of the fort. Military stables, brewery and a Kali Temple are also located within the complex. Apart from the historic gates, the fort complex also contains a Hanuman statue. In addition to being a favourite weekend retreat, it is also a popular trekking destination. Khadakwasla is one of the major sources of water supply to the city of Pune. Khadakwasla is the chowpatti of Pune. Khadakwasla is popular for the 'bhelpuri' and 'bhutta' by the lake and the merry atmosphere, more like a carnival, with camel rides and numerous chat stalls along the bay. Khadakwasla, on the way to Sinhagad, is a popular stop over on the way to Sinhagad. Very popular especially during weekends Khadakwasla is like a evening hangout for the punekar. Khadakwasla is one of the prime picnic spots near Pune. In fact, it is a great place if one is looking for a one day picnic spot with its great views, good weather and warm people. Khadakwasla as a picnic spot allows the opportunity to get out from the city and spend some time with your loved ones. Khadakwasla is one of the prime picnic spots near Pune. In fact, it is a great place if one is looking for a one day picnic spot with its great views, good weather and warm people. Khadakwasla as a picnic spot allows the opportunity to get out from the city and spend some time with your loved ones. Saras Garden is located in the background of Parvati Hills. Constructed by Nanasaheb Peshwa, the garden has fountains and lush green lawns. In the garden, a temple is also present. Dedicated to Lord Ganesha, the temple was constructed in 1774 by Madhavrao Peshwa. The garden also contains Ganesh Murthi Museum, enclosing large number of Ganesh statues. In early morning as well as evening, joggers and walkers frequent the garden. Soon after completion of Shree Devdeveshwar Temple on Parvati Hill in the 18th century, Nanasaheb Peshwa decided to beautify the environs of the hill. Owing to this, he constructed a lake at the foothills of Parvati Hill. In the centre of the lake was established an island of about 25,000 sq ft area. Later, on the island, a beautiful garden was created. Sawai Madhavrao Peshwa built a temple dedicated to Shree Siddhivinayak Gajanan in 1784. Shinde's Chhatri was constructed as a memorial of the Maratha noble character Shri Mahadji Shinde. The 18th century military leader, Shri Mahadji Shinde, served as the commander-in-chief of the Maratha army under the Peshwas from 1760 to 1780. Located in Wanowrie, the memorial is actually a hall that marks the spot of Mahadji Shinde's cremation on 12 February 1794. Reminiscent of the Maratha rule, the structure is known for its exquisite architecture that reflects the style used in Rajasthan. Made out of iron, the entrance gate shines till this day. The complex of the memorial had a temple, dedicated to Lord Shiva, which was built by Mahadji Shinde, in 1794. Outside the sanctum sanctorum of the Shiva Temple, a samadhi (memorial) was constructed in 1965. The structure was constructed following the Vaasthu Hara rules. Founded in the year 1890, Mahatma Phule Museum is one of the must-visit Pune tourist attractions for history buffs. Earlier established as Lord Ray Museum, the museum was renamed as Mahatma Phule Museum in the year 1968. The museum makes for an interesting trip as one can see various collections of industrial products, agricultural items and handicraft pieces in this museum. Although the place has been about 118 years old now, it presents the old-world charm in the most amazing way to the tourists. If you wish to know more about the unique culture and rich heritage of India, Mahatma Phule Museum is a very educational experience for the tourists. Other notable and interesting collections which one can see here include brassware, stone carvings, marble statues, oil painting, textiles, body samples of animals from seals to elephants and so on. Pataleshwar Caves Pune is dedicated to Lord Pataleshwar – a name dedicated to Shiva. ‘Patal’ translates to ‘underworld’, and ‘Ishwar’ translates to ‘Lord’. Inside the caves, there is a temple dedicated to Lord Shiva and Nandi, which was made from an excavated monolithic rock during the reign of ‘Rashtrakuta Dynasty‘ in 8th century AD. Passages, circular Nandi Mandapa, and massive pillar are the noticeable features of the conserved site. Panchaleshwar or Bhamburde Temple are the other names of Pataleshwar Temple. According to the legends, the temple was built in just a few hours by the Pandavas when they were out in the exile and needed a shelter. The seating arrangements for tourists inside the small temple rooms have been designed to perfection so you can sit and marvel at the true grandeur that the temple is. The temple looks like a true beauty with all the finely crafted pillars, giant circular stones, and rotunda roof. Nandi Mandapa, another specimen of fine craftsmanship, sits beneath the roof. The sound of the bells is also unique. Taking a closer look you will find similarities between the architecture of Pataleshwar temple and Elephanta Caves. Nightlife in Pune is definitely taking a turn now which is surely a positive one. A number of restaurants, as well as clubs, are opening up in the city thereby giving the people an opportunity to chill after their office hours. Some very sizzling places have been coming up in different parts of the city. The city is very famous for it being a corporate hub and having educational institutions and thereby has a huge population of youth settling in. Nightclubs are worth visiting with delicacies available at nominal prices. The timings too are decent and give people a chance to dance their worries away. Pune has been identified as the second best city to settle in. You must be wondering why? The places mentioned below speak for themselves. These include- Mi A Mi which is a restaurant with a relaxed environment and can cost decent up to INR 2500 for two people. Stone Water Grill is another sizzling lounge wherein the cost for two is approximately INR 2500. High Spirits in sync with its name boosts the energy and takes it to a different level altogether and costs INR 1500 for two. The fish bowl is an open roof restaurant with a fantastic view. It is a perfect place to relax and costs INR 3000 for two but is totally worth it. As the name suggests, Kelkar Museum was established by Baba Dinkar Kelkar, in the year of 1962. Located in Shukawar Peth, on the Bajirao Road, Raja Dinkar Kelkar Museum is one of the popular sightseeing places in Pune. Presently, it is under the control of the the Department of Archaeology, Government of Maharashtra. Raja Dinkar Kelkar Museum has a collection of almost 20,000 articles, belonging to different parts of the world, which were collected by Baba Kelkar. He had built this museum in the remembrance of his son, who died at young age of seven. However, currently only 25,000 of the items are on display for public. The assimilation of the items displayed took him almost 40 years. He had close to 15,000 artefacts to be displayed in the museum by the year of 1960. However, in 1962, he handed over his assimilation to the Department of Archaeology, which is now displayed in the museum. An impressive collection of musical instruments, Mughal lamps, paintings and other antiques, paintings on the scenes from mythological epic Ramayana, nutcrackers, Ganpati's guns, carved palace doors, excellent pottery collection, vessels made up of terracotta, copper and brass, etc. are a few of the items which are displayed at Raja Dinkar Kelkar Museum in Pune. There are also statues of Lord Ganesha, Lord Shiva and Goddess Parvati at the museum. One of the most attractive features of Raja Dinkar Kelkar Museum is the replica of the Mastnai Mahal, originally built in the year of 1734. This room, with its luxurious décor, grand chandeliers artistic paintings presents a setting, similar to that of the palace. Inside the Raja Dinkar Kelkar Museum premises, you will find Research and Storage facilities. Inside the complex, the Institute of Musicology and Fine Arts is also located. Built in the year of 1811 by Peshwa Baji Rao the second, Vishrambaug Wada is a three storied Peshwa mansion, which still captivate everyone with its historical richness which it symbolizes now. Situated in Sadashiv Peth, at the intersection of Bajirao Road and Laxmi Road, this wada, although in neglect state, does display an excellence of architecture. The entrance is also magnificent with its carved pillars which are made up of teak-wood, still standing strong. The Vishrambaug Wada stands majestically amidst the hustle bustle of a busy market. Its cypress-shaped columns, decorated ceilings, stone floor and teak gallery on both the sides of entrance take you to a glorious era of Bajirao. On the first floor of the building, you will find a huge hall, darbar, with intricately carved ceilings, grand chandeliers along with teakwood pillars with exquisite carvings. Its magnificent teak balcony, where visitors are not allowed now, is said to the place from where Bajirao's musicians used to perform. A part of the wada is open for public visit, with the rest of the part being used as offices. Although just a few parts are seen, this place is worth exploring. It gives you a glimpse into the grandeur of Bajirao era in Maharashtra. The impeccable fineness with which it was constructed is something worth remembering and admiring. After the British take over, and the decline of Peshwa rule, Vishrambaug Wada was used a jail. It was also used to house the Pune Municipal Corporation office, from the year of 1930 to 1958. Currently, a number of Government offices operate from Vishrambaug Wada. A considerable section of it is also used at the post office. There is also a handicraft shop by SMILE (Savitri Marketing Institution for Ladies Empowerment) inside the Wada complex. Located in Nidgi, Pune, Appu Ghar boasts of being the very first amusement park in Pune city. It was inaugurated on 19th November of 1984. This amusement park was named after the mascot of Asian Games of 1982, which were held in Delhi. An elephant, named Appu was the mascot of the games. A theme park, Appu Ghar is situated in Indira Gandhi Udyan, which was earlier, used to be called as Bund Garden. Often referred as a mini Disney land of Pune, this place not just offers innumerable fun rides and but also a serene lake and hilly terrains, waiting to be explored. The vibrant environment of this park, accompanied by a number of fun rides and excellent facilities, make this one of the most popular places in Pune. There are rides for every person, varying from children rides to thrilling for adults. Some of the thrilling rides, which you can try here at Appu Ghar in Pune, are Appu Columbus, My Fair lady, Roller Coaster, etc. For those, who love adventure and enjoy the adrenalin rush, these rides perfect for them. For children, there are special rides, equally enjoyable and safer. Helicopter, Appu Express, Gammat Girki, Merry Go Round, kiddy boat, Jumping Frog, Mini Octopus, etc. are some of the rides. Not just these, rides such as Merry Cups, Guided car, Striking Car, Bhoot bangala, Bhool Bhullaiyya and Tele Combat gives an opportunity to entire family to enjoy together. Appu Ghar is open throughout the week. You can visit this amusement park at any time from 12 noon to 8 in evening. A minimal amount of fee is also charged for entering. For the convenience of the visitors, there are various packages also offered, catering to different preferences and interests. There is also ample of parking area at Appu Ghar, for both 2 and 4 wheelers. St. Mary's Church was built in 1825 and is one of the oldest churches. Its foundation was laid down by Bishop Heber. It was built as a place where the officers and soldiers belonging to the British time could worship. The church has a mixture of British as well as Indian architectural style in addition to the Gothic architecture. It is a beautiful place to be visited and enjoyed with your family. It is a perfect place to rejuvenate and go sightseeing. Every Sunday, a group of around 1500 members sings carols in the church and carries out the prayer. The church also houses the remains of Sir Robert Grant who was the most honorable councilors of the Queen and was also the Governor of Bombay. The church also has the remains of Sir Edward West who was the chief justice of Supreme Court at Bombay. A stained glass was fitted at the altar in 1874 in the loving memory of Lieutenant Trotter. In addition to this stained glass, the church also consists of regimental flags. The church is worshiped on a daily basis with the help of pipe organs which are 130 years old. Located on the Queens road, near the pune railway station, Tribal Museum is a place you must visit, to get an idea of the tribal life of Maharashtra. Dedicated to the various tribal communities, depicting their culture and belief systems through their lifestyle, Tribal Museum presents a great opportunity to every visitor. It gives tourists a chance to have a deeper understanding of the world alien to us. The museum offers a detailed glimpse, especially into the lives of those communities, residing in the Sahyadri and Gondhavana regions of Maharashtra. Here at the museum, you will find an excellent and detailed collection of photographs and various artifacts, depicting the culture, traditions and the lifestyle of indigenous tribal community residing in this state. The excellent compilation at the Tribal Museum is a result of the ardent work of museum authorities. Through the documentation done here, you can see various items, which have been part of tribal living. It also offers with a detailed insight into the intricacies of their lives. That is the reason, why this museum is often frequented by many researchers and analyst, looking for a better understanding of tribal community of the state. This super popular street on Deccan Road is 'THE' place for street shopping. By the array of accessories to choose from, Shopaholics will be easily taken away. The accessories like bags, books and mobile stores are what dominates this lane. Shops here are overloaded with mobile phone cases and decked with sunglasses, caps and wallets. You will find caps of all shapes, sizes and designs with bags sold in abundance for men, women and kids. The amount of footwear available here is overwhelming. Jewellery addicts are sure to go gaga over the number of choices of earrings, rings and necklaces available here at slashed prices. Other get-at-able commodities here are watches, leather belts and dials. This is an ideal place to put your bargaining skills to work. Situated on the Moledina Road, David Synagogue, also known as Ohel David Synagogue, was built the Late David Sassoon. Its construction was started in 1863, which was completed in 1967. David was known for his philanthropic works in Pune. He had also built the Sassoon Hospital. Because of the red bricks used in David Synagogue construction, it is popularly known as Lal Davel or Red Synagogue or Red Temple. Although it is a place dedicated to Jewish community, it attracts visitors from all section of the society, from all over the world. Its startling architectural beauty, combined with the religious significance, makes for a worth remembering sight. It has been constructed in the neo-Gothic style, and displays a unique usage of various shades of colors. This Synagogue used to see more number of Jewish visitors during the monsoon and summer season. As many Jewish residents from Mumbai and nearby places would spend their summer and rainy months here in Pune, owing to its better climatic conditions. In the premises of the David Synagogue, there is tomb of the Late David Sassoon, where he had resided when alive. In its premises, you will also find a Mikvah. Apparently, a Hazzan from Mumbai goes to this synagogue to conduct Shabbat prayers. One of the popular tourist attractions of Pune, this Synagogue captivates visitors with its structural beauty. The spiritual calmness, which it radiates, also presents tourists with an opportunity to rejuvenate themselves amidst the clarity and tranquillity of this place. It is a perfect amalgamation of entrancing beauty and religious sanctity. It is easily accessible. Once can take a direct taxi or auto rickshaws to this place. There are also many buses until here. Chavand (or Prasannagad) is a hill fort in the state of Maharashtra. Located at an elevation of about 3500 feet from the ground in the district of Pune, this fortress is a part of the 'famous five'. The other forts which are included under this category are Hadsar, Shivneri, Jivdhan and Naneghat. The fort is remarkable for the the seven water tanks laid out in a single line, carved out from a single rock. There are some cannons on the way upto the fort. There is a Chamunda temple atop the citadel with a water tank situated beside it at the highest point on the fort. The famous Kukdeshwar temple and the river Kukdi are visible from the southern end of the fort. Hadsar is a hill fort in the state of Maharashtra. It is situated at an elevation of 3200 feet from the ground in the district of Pune. Within the fort there are massive tunnel like entrances built in the Mughal style. There are neat, rock-cut steps which lead up to these twin gates. Besides, there are cisterns of water and water tanks within the sparse fortifications. There is a Shiva temple atop the fort and a pond facing it. The citadel also has vast underground chambers which were used probably as storerooms. The Shiva temple has stone carvings of Ganesh and Hanuman on its corners. Korigad is a hill fort in Maharashtra. Situated in the district of Pune, the fort rises to a height of about 2800 feet from the ground. Though not much of the fortifications are intact, the entire wall of the fort is completely intact. One can choose to walk along its 2 kilometres long perimeter. There are caves and cisterns of water within the fort. There are two expansive lakes atop the citadel, and a temple dedicated to the patron deity of the fort, Koraidevi. A large cannon rests adjacent to this temple. There are other cannons atop the fort as well. Temples of Shiva and Vishnu can be found at the top. The top of the fort presents a very commanding view of the Amby valley city developed by Sahara along with Tung and Tikona to one side. Purandar is a fort in the Pune district of Maharashtra. Purandar and Vajragad are twin forts. Purandar is the larger of the two and is situated at a height of 4472 feet from the sea level. The top of the fort presents a very scenic view of its twin fort Vajragad. The fort has two distinct levels. The lower part has a number of temples dedicated to the patron deities of the fort. This level also has a catholic church dating back to the 19th century, not very far from its first entry point. The upper level houses the Kedareshwar temple, which is also the highest point of the citadel. There are a pair of water tanks at the top of the hill. Rajgad – as the name suggests is Royal Fort or King of all Forts, truly one of the most fascinating treks. It is an epitome of high class architecture of the great Maratha Chhatrapati Shivaji Maharaja. The treacherous approaches, zig-zag narrow paths, the deceiving double-walled shield of its fortifications, massive Maha darwaja and Chor darwaja tells the tale of the Fortress of the forgotten empire. The beauty of the fort and the surroundings is mesmerizing. The sunrise from Balekilla is a must watch. 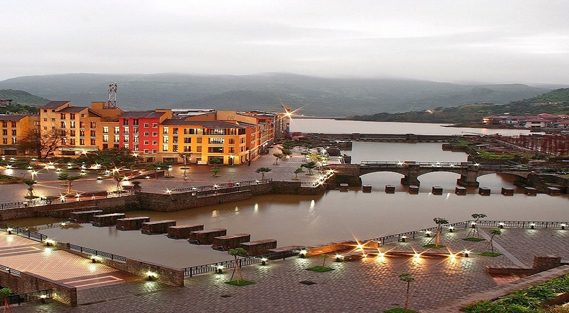 The fort offers magnificent views of the lush green Sahyadri range. In October the entire area is covered with colourful wild flowers combined with clear blue sky and the splendour of the fort is captivating. It can be done as a single day trek but to cover the entire fort you need to do a 2-3 days trek. Rohida, or Vichitragad as it is also known, is a Fort nearest to Pune, a destination which is a must on every trekker's to-do list. The trek is rather easy, which gives you all the more opportunity to take in and lose yourself in all the beauty that this hill has to offer. Satisfy the nature lover, adventure junkie and history enthusiast in yourself all at once with a visit to the amazing Rohida Fort. National Defence Academy or NDA near Pune is a tri-service military academy where fresh cadets are trained for Army, Navy and Airforce. Visitors, with prior permission, can witness first-hand the training procedure, weapon and technology and the architecture on the premise. The museum of NDA is a must-visit, as it houses multiple archives, models, memorabilia and other details about Indian military history. Dagaduseth Halwai Ganapati Temple is named after its founder-builder, who constructed the simple yet decorated shrine for Lord Ganesh in 1893 upon the advice of his guru, after losing his son to an epidemic. This is the temple where the famous Ganesh Chaturthi Utsav of Maharashtra was first held in a mass-scale for the public. The idol is ivory white and covered with gold offered by the devotees. ISCKON NVCC or New Vedic Cultural Centre in Pune is a cultural, religious and spiritual centre as well as an educational hub. Eminent spiritual preachers take turn to impart knowledge about Krishna consciousness, our oneness with the cosmos and how we can achieve our self-actualization through understanding of Vedic literature and their values. Other than the temples for various forms of Krishna and Radha, there are also restaurants, guest houses and souvenir shops inside. Sri Balaji Mandir of Pune is a close replica of the renowned Venkateshwara temple at Tirumala, Tirupati. Not only the architecture and the look of the sanctum deity, the temple follows its influencer in rituals and religious activities as well. With beautiful, lush green surroundings, free meal and a calm environment, Sri Balaji Mandir is a great alternative for those who cannot make the journey to the original. The Katraj Jain temple is an important shrine for the followers of Jainism. It has idols of all of the 24 Tirthankars of Jainism. The main deity is the 24th Tirthankar, Lord Mahavir. His statue sits in the middle in a bright golden shade, made of Panchdhatu. Perched atop a hill, the temple offers a peaceful environment for the devotees to offer their prayers. Pune Okayama Friendship Garden is a 10 acres big open patch of land with beautifully curated green lawns interspersed by walkways and occasional streams. The natural recreational site is influenced by the 300 year old Koraku-en Gardens of Okayama, Japan. Visitors can take a lovely evening walk in the garden and over the bridges, take in the fresh air and enjoy the lovely landmark that keeps changing. Sarasbaug Ganapati Temple is a shrine for Siddhi Vinakayak Ganesh, as established by the Maratha ruler Shrimant Sawai Madhavrao Peshwa, in 1784. The temple derives its name from the island where it is situated, called Sarasbaug, named by its creator, Madhavrao's predecessor, Nanasaheb Peshwa. Located at the foot of Parvati Hills, the lake around the temple is said to be the venue of secret meetings held by the Peshwas during boat rides. Chaturshringi temple, or the temple of the ¥goddess of the four peaks' is an abode to Devi Chattushringi or Amabreshwari, built by an ardent devotee, merchant Durlabhseth Pitambardas Mahajan, during the Shivaji reign. Legend says he got a vision from the goddess herself, and found a self-manifested deity at this spot, atop the hill and established a shrine. The same has grown into the current shrine, with a 100 steps to reach the sanctum. Amanora Shopping Mall in Pune is the locals' favourite hangout spot for the afternoons, and also a great place to spend an urbane weekend with family. From clothes to accessories to electronics to motorbikes, you will find an extensive variety of both Indian and international brands. To cater to your pangs of hunger while window shopping, there are food courts and eateries as well. The open arena in the middle is the place to sit and relax, and occasionally there are bands performing or flea markets selling goods at a lucrative price. Bhuleshwar temple, though a Shiva shrine, has a unique edifice which comprises of non-Hindu features like minarets and dome peaks, to protect it from demolition at the hands of Islamic invaders back in the days. One legend goes that the Pandavas themselves built the temple here, but perhaps it is King Krishnadevray who built it in the 1200s with five lingams. The Mangalgad fort surrounding the temple is comparatively newer, built in 1630. The original Lal Mahal used to be Maratha lord Shivaji's childhood home, which his father built for him and his mother Jijabai. This is where the famous Shivaji-led guerrilla attack by the Marathas upon Shaesta Khan and his Mughal army took place. Though it turned to ruins by the end of 17th century, it was partially revived by the Peshwas, and then later reconstructed by municipality as a memorial hall housing several paintings and models depicting Shivaji and Jijabai's life. The Empress Botanical Garden is named after Queen Victoria back when she held the sceptre. Once a favourite among the British officials and thus also named Soldier's Garden, the place is now a sprawling greenery of 39 acres with hundreds of rare species in trees and flowers. Empress Garden makes for a great place to take a stroll in the afternoon, learn about our flora in the flower exhibitions and breathe in some fresh air away from the city traffic.